With an incredible 120 tables indoors and room to seat a further 150 diners outside, this popular New Forest pub is a lively place on a summer’s day. It’s also somewhere you will be drawn to for a hearty meal as Ben, MD of mags4dorset, and I discovered. The added bonus is that it is surrounded by the picturesque Forest and the chances are you will see ponies foraging outside. Refurbished in the last year and with a new general manager, and former First Class long haul cabin crewmember, Paul Williams, on board since January, the pub’s reputation is being taken to new levels. Paul already has plans to take the Red Shoot’s own micro brewery forward by producing enough beer, not only for the Wadworth Estate, but also for new free trade markets. Tom’s Tipple, Muddy Boot and New Forest Gold are the three beers brewed on the premises, which join the Wadworth range, and are in high demand with Red Shoot customers. When Ben and I visited to sample the menu, the food wasn’t the only thing on Ben’s mind. He clearly wanted to try the beers too. Paul welcomed us with a drink, a refreshing ginger beer for me, and Tom’s Tipple for Ben, which he enjoyed in the build up to the meal. My prawn cocktail did not nestle in the lettuce leaves with a bed of salad underneath to trick me into thinking there were more prawns than I could see. Oh no. 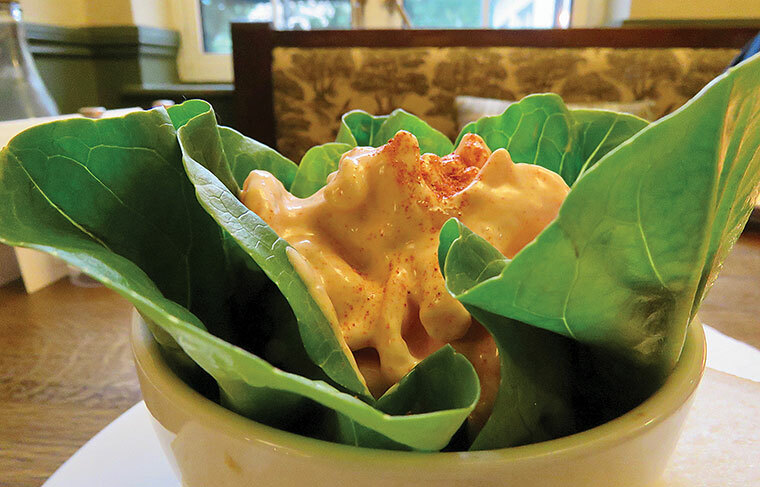 This prawn cocktail fairly bulged out of its lettuce leaf nest, and every time I put my fork in, a whole stack of plump prawns, dripping with deliciousness made its way into my mouth. It was the largest, and freshest tasting prawn cocktail I had eaten in a long while. And with four large triangles of bread and butter to help it down, I was beginning to feel rather full. 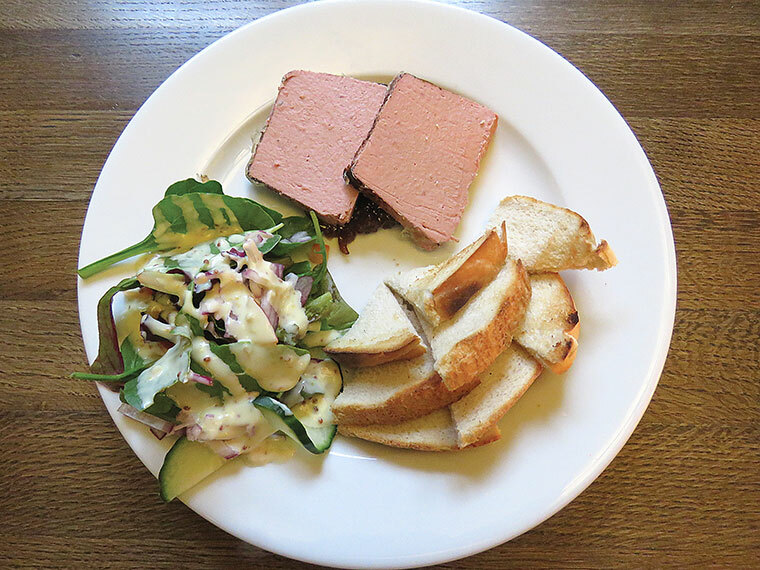 Ben’s two generous portions of smooth chicken liver paté, presented with toast and a salad, gazed at him from a bed of caramelised onion. He soon cleared his plate and was ready to roll with the next course. 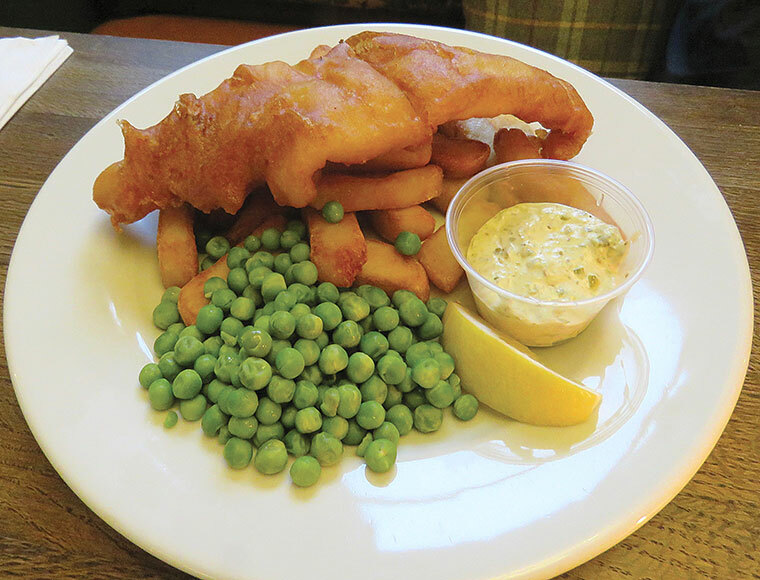 A fish of the day coated in Wadworth beer batter, served with chips, peas, tartar sauce and lemon arrived for hungry Ben. The cod looked handsome in its dark, crispy coat, and wasn’t long on the plate, neither were the chunky chips that simply melted in the mouth. Ben now admitted that he was feeling rather full, but even so, he ordered a pint of Muddy Boot and we swapped chauffeur duties. He praised his Muddy Boot and said it seemed to have a delicious chocolaty note. It suited his palate more being a darker malt than Tom’s Tipple, which he said had a lighter, hoppy flavour. 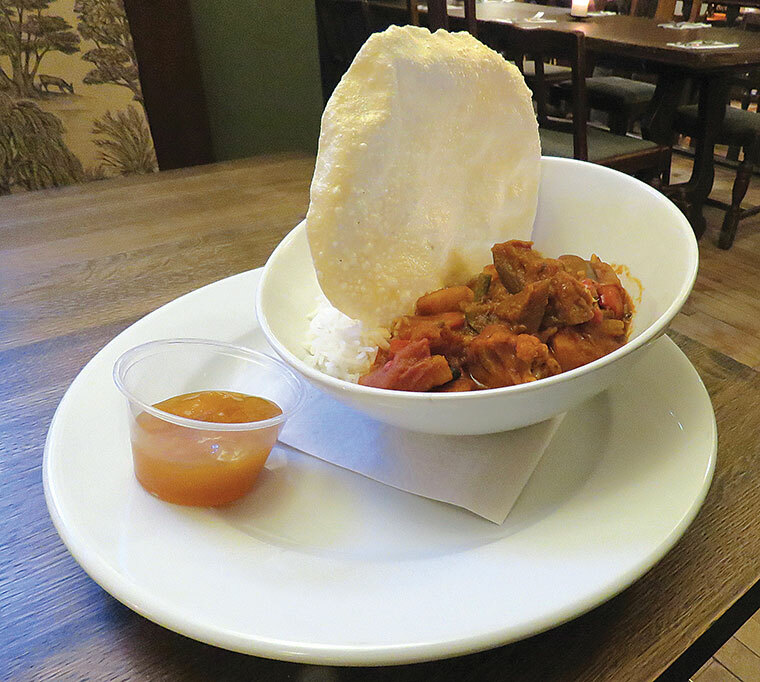 Once moored on the table, my spiced vegetable curry with basmati rice, and a glorious poppadum sail was a visual feast. The vegetables were large and crunchy and included green beans, courgette, aubergine, red and green peppers and cauliflower. The rice was light and fluffy and the fiery heat of the curry warmed the mouth and left an after burn, which was somewhat sated by the mango chutney. Despite its deliciousness, the portion defeated me. We had to take time out before building up the courage to order a dessert and, as much as we had set our hearts on two at the beginning, this wasn’t going to happen. Firstly, the chocolate crunch dessert had just run out and secondly, I couldn’t contemplate having a lemon meringue to myself. Instead we agreed to order one portion of chocolate fudge cake filled with sweet salted caramel sauce and a layer of chocolate fudge, coated in chocolate fudge icing with brownies. When asked if we would like custard, ice cream or cream, I couldn’t believe my ears when Ben asked for CREAM! The dessert was gigantic and tasted even better than it sounded, as it arrived warm. 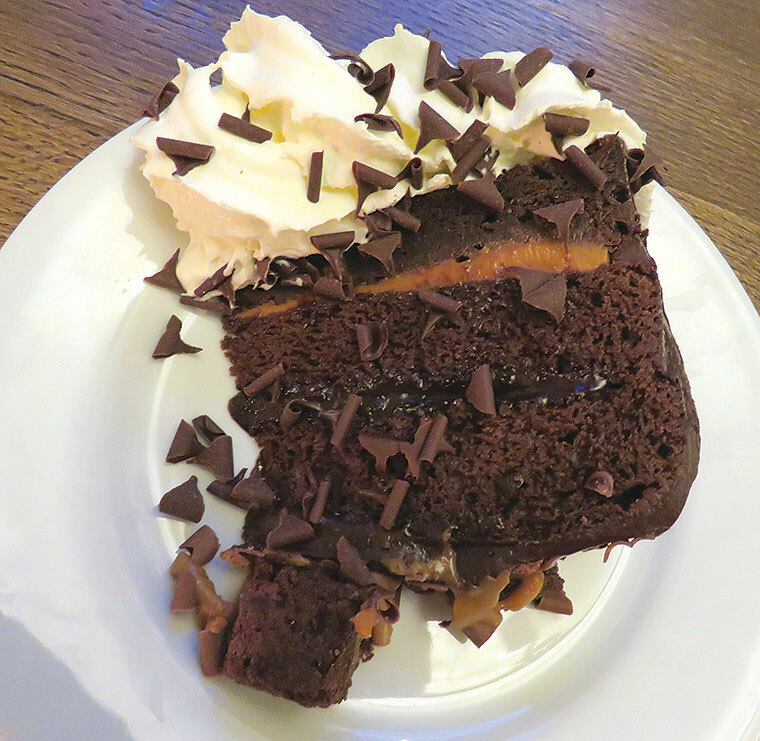 The cake was rich and heavy – a chocoholic’s paradise and the salted caramel really added that wonderful contemporary dimension. After polishing off the last crumb, (Ben had to eat all the cream), we sat for a while. Paul was pleased to note our satisfaction, and reminded us that there is a Small Plates section on the menu, which we foolishly glossed over when we arrived. Next time, I shall definitely scrutinise that in more detail. Eating a full three courses from the main menu was definitely a challenge for us. Do you think you might fare better? If so, you might like to put yourself in the firing line at the Red Shoot and let us know how you get on. If it’s Sunday roast you decide on, don’t forget to book as the pub gets really busy. And for information, there will be a beer festival with guest cask ales and ciders with live music and a BBQ, on 29 June to 1 July. So why not head down to the Red Shoot and enjoy!